“Gifted” finds a collective of competent people making a perfectly competent movie — nothing more, nothing less. 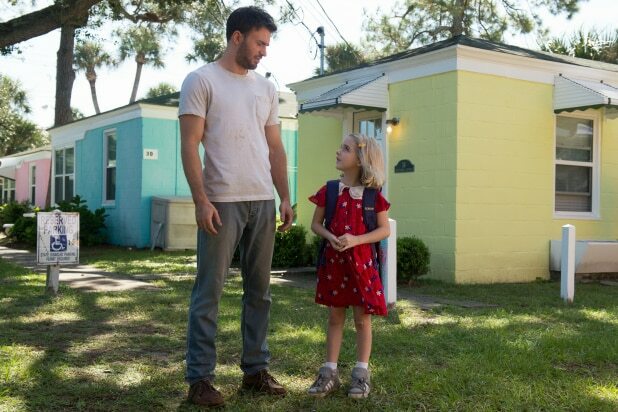 Opening in central Florida, the film stars Chris Evans as Frank Adler, the caretaker of seven-year-old Mary (Mckenna Grace, “Designated Survivor”). Mary is, without confusion, a child genius. She comes from a prodigal mother who took her own life, and a family of Ivy league-educated sophisticates. At the wish of her late mother, Frank is tasked with the position of surrogate father. The two of them reside in a house that’s quaint, but homey, with a loving neighbor (Roberta, played by Octavia Spencer) always nearby. Frank and Mary’s rapport is more friend than parent, and they’re both happy with this dynamic. Hellbent on injecting normalcy into her life, Frank enrolls Mary at the local public school. Within minutes during her big first day, she stands out. Answering complex math equations without the assistance of a calculator, the young girl’s acumen startles teacher Bonnie (Jenny Slate), who’s uncertain how to handle the confident and quick-witted Mary. “Gifted” has the wind-up of movies we’ve seen before: Prodigal wunderkind with an absent parent desperately seeks for a childhood that appears quotidian. While the film trots along with its fair share of unabashed sentimentality, what’s striking is Mary. Since 2013, Mckenna Grace has seemingly been working around the clock in film and television. At 11, she’s been cast in over 41 projects, which might be breaking some kind of record for child acting. The time spent honing her craft has paid off: Rarely do we come across such warmth and grace in pre-teen performers. Where some of her peers can be aggravatingly precocious or obnoxiously erudite, Grace fundamentally understands this role. Mary is a child existing in an adult world, one that’s in jeopardy once grandmother Evelyn (Lindsay Duncan) makes an impromptu appearance. Evelyn contests that Mary ought to be living with her (in Massachusetts), where the girl’s intellect can be properly cultivated and put to use. In response, Frank protests, citing the wishes of his late sister, who wanted her child to have a different life than her own. Although she won’t make the admission, it’s clear Evelyn sees Mary as an opportunity to course-correct and to get her late daughter’s life right this time. Over a prolonged stretch, “Gifted” twists and turns into a court procedural. Evelyn and Frank duke it out in front of a judge to prove who should really be raising Mary. Although the courtroom dynamic is miles away from the rest of the film, director Marc Webb (“The Amazing Spider-Man,” “(500) Days of Summer”) makes it (mostly) work. Written by Tom Flynn (“Watch It”), the film evolves into an interesting conversation about the responsibility of those harboring genius. Frank, mid-30s and single, admits in an outburst to Mary that he wants part of his life back. Fatherhood wasn’t exactly in the cards, especially of this variety. Although gifted himself, he spends his days fixing boats at the marinas around town. On Friday nights. his only time away from Mary, he goes to a bar and drinks alone. Lately he’s accompanied by Bonnie, who insists to Frank that they “can’t do this.” It’s a classic parent-teacher fling, and the actors have enough chemistry to keep you watching. This is true of “Gifted” throughout. Its missteps are those you’d expect from movies of this nature: the third act is lazy, convoluted, and unfurls in ways we’ve seen before. The score by Rob Simonsen (“Miss Stevens”) matches the title of the film: painfully on-the-nose and uninspired. Its style is bland at best and non-existent at worst. The shot selection is rote, lacking even a single visual flourish. Even the in-fighting between Frank and Evelyn grows tired in time. What works, though, is when Webb finds footing in the recognition of his characters. Evans, Slate, Duncan and Spencer each manages to unearth a nugget of truth that makes these fictitious characters become real people. Consequently, “Gifted” doesn’t settle for easy answers. The resolution is more painful and complicated than any of its characters would like it to be. (It also contains three different endings, but that’s a subject for another day.) By the end, Webb figures out that messiness is not only okay, but inevitable — the natural byproduct of fully fleshed humans whose lives are frustrating and imperfect.